They lost the game, but they won our hearts. The women’s soccer team has exited the regional playoffs after a heartbreaking 2-1 loss against Lee University in Pensacola after a double overtime battle. Despite conceding after only 10 minutes, the Tars kept their cool and equalized in the first half when Kathryn O’Brien (‘20) surged through a gap in the defense to score her seventh goal of the season. A highly contested game followed, with both keepers pulling six saves each. In the last five minutes of regulation time, Rollins even had an attempt cleared off the line. “They had their chances, we had ours,” said Head Coach Alicia Schuck. “The game could’ve gone either way.” Frustratingly, the Tars conceded with only 90 seconds left on the clock, after a commotion in the box following a deflected free kick. The game was the curtain call for seniors Kiera McMeekan, Shalisa Crowell, Yaya Mbengue, Jill Richards, and Megan Welliver. Rollins began the season with a lot of room for improvement after a disappointing 2017 campaign, when 16 new players were introduced to the roster. This posed difficulties for both players and coaches. “We didn’t know the team as well as we do now,” Schuck said. “They were too inexperienced; they did not realize how tough the conference was. We had a different lineup every game of the season last year.” Last year was a harsh learning experience for the Tars, but a learning experience nonetheless. Things started to shift during spring preparations. Goalkeeper Kelly Rowswell (‘20) noted the progress in team chemistry, work ethic, and accountability. “Our captains showed great leadership, and we all responded to that with our best efforts and hard work,” Rowswell said. Rowswell, arguably one of the best collegiate keepers in the country according to her coach, was the only goalie in this year’s roster, and that brought its own challenges. “With another keeper you would split all the reps at practice, and you pushed each other and competed. My coaches handled this very well and made sure I had proper rest and was still being pushed to my best,” said Rowswell. For Schuck, continuous improvement is in the team’s future. Whether it is Rowswell, the top scorer O’Brien, or the rest of the team, the question Schuck asks always remains the same: “How can we make them better?” To ensure continuity at the highest level, there are no shortcuts. “We did it not by luck, or chance, or hoping for the stars to align for us. It was a lot of work. 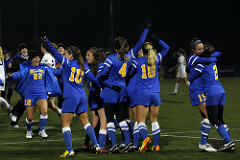 We earned our way through post-season to an NCAA appearance,” said Schuck. For Rowswell, it was important to take things one step at a time. “The post-season progress was a little nerve racking but so exciting at the same time. For most of the players, it was a new experience for them since we didn’t qualify last year,” she said. “We became more specific. We were much more clear on how we coached them [and] how we wanted them to play,” said Schuck, refusing to leave anything to chance. The style of play thus grew from day one, especially because Rollins challenged itself against high-profile competition. “We played legit NCAA teams right away. That was a huge difference from the year before,” said Schuck. In between preserving the identity of the group as a whole and reinventing players to be better, faster, and stronger, the sky is the limit for Rollins. As we look to the future of women’s soccer, it is important to acknowledge the true dimensions of this year’s efforts.